It’s not breaking any new ground to eat at, or indeed review, a Wagamama restaurant. I did find our recent dining experience there interesting, however, for what it demonstrated about the food journey both the restaurant and I have travelled since we first became acquainted. The first Wagamama I came across was in Covent Garden, London, and from that first encounter something in their cheeky menu and underground, brightly-lit space had big appeal. I ate there several times in London and Guildford. A few years ago Wagamama were ostensibly too mass-consumerist for my taste, with new restaurants popping up with the regularity of big-chain coffee houses. But their food was innovative, fresh and well-priced, commodities that are exceedingly hard to come by in England. I’ve eaten there a couple of times in Australia and the biggest difference I’d noted was the absence of my favourite dish, the chicken chilli men: soft Hokkein noodles interlaced with diced chicken and crisp vegetables such as snow peas and capsicum, heightened by a good breath of chilli. Before ordering on our most recent visit, SG did question whether I’d be alright, ‘eating at a franchise’. I assured him I’d be fine: I’d eaten here loads of time, always enjoyed it and had made my way through most of the menu, from ramen to yaki soba to the katsu curry, both vegetarian and meat. 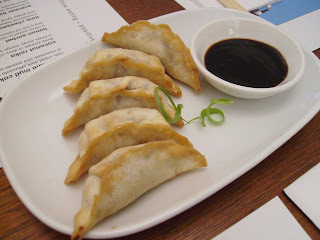 First to the table was a tray of five duck gyoza, with a very thick, sticky soy sauce. The filling was lovely: lightly steamed meat and some spring onion crunch. The pastry, however, was very poor: more like a biscuit, crunchy and noticeably browned. SG stuck with his staple, the chicken ramen. 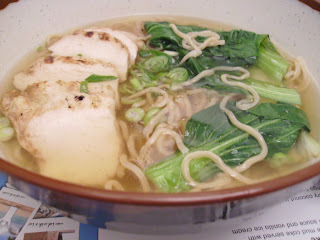 A relatively clear broth, plenty of sliced chicken, stocky noodles and some green for roughage. It's a heartening dish, but...I'll come back to that. I went with a new dish, the spicy chicken itame, with mint, basil, coriander and garlic. 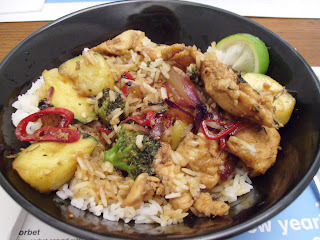 The chicken had wallowed in ginger and the red onion lent a caramelised flavour to the rice. It looked a treat in the bowl, with chunky zucchini and broccoli pieces crowning the rice. (And it was hot, more than could be said for our green tea). The chicken, however, was far too dry. The dish was seriously spicy; probably not too hot for a real chilli lover, but significantly spicier than anything I’d experienced at Wagamamas before. Although the vegetables had looked impressive and abundant, there were serious filling-to-rice ratio issues: the former ran out long before the latter. While Wagamama may not quite be soul food, they have always preached a vibrant and positive food philosophy. These dishes didn't give me a good food buzz though, nor did the service. After eating I felt uncomfortably full, overly salted and like I’d eaten…well, franchise food. The ramen was perfectly adequate, but I don't necessarily want a dish I haven't tried for a couple of years to taste exactly like it did last time I had it, especially when that last time was in a different country! I don’t know if it’s just that my tastes have changed and refined, or if in keeping Wagamama afloat they’ve started to cut a lot more corners in the kitchen. Certainly the company had to close down its St Kilda store last year, not that long after opening in Melbourne Central. Their expansion into Australia has never been as rampant as it was in Europe. When you’ve got Don Don across the road doing wok-to-bowl food for $6, and Cookie down the street serving up very credible curry, you need more than cute branding to keep it pumping.